We leave from platform 5 of Shrewsbury station bang on time at 9.05am and go straight down the Marches mainline as far as Craven Arms. The train does a steady 60 mph for most of the way, apart from a brief stop at Church Stretton, where no one gets on or off. We then stop to get the token just before Craven Arms station, from the signal box, stopping right across a level crossing to do so. We then cross over onto the down line and stop at the station which is no longer called "Craven Arms and Stokesay". There is a nice sign telling passengers about local attractions, but there is no longer a station building, just a couple of brick shelters on each platform. We leave the mainline on our left and start going in a south westerly direction all the way to Llanelli on a single track. The scenery is mainly low hills with sheep grazing in them, but it is fairly flat on either side of the tracks. We soon arrive at Broome station, slowing down but not stopping. Then we speed up to about 60 mph as we start to climb upwards. We are on unwelded track, which will stay like that for most of the journey. We soon slow down as we come into Hopton Heath station. It has a nice station building, which is now a private dwelling and we don't stop here. We speed up to 60 mph again, passing corn fields on both sides. It then gets more wooded as we slow down to walking pace as we go over an open level crossing. We then stop for the first time at Bucknell station, which has a large white stone station building. An old lady is waiting to get on. There's a few recently built houses on the left hand side and then we're out into the countryside once again. We go into a wooded cutting and start to climb once more. We run next to the River Teme on the left and have a large hill on our right. We reach 60 mph again. We then descend a little and slow down, before coming into Knighton station, which has two platforms and a large grey stone station building on the left. Several people get on or off here. It even has the blue electronic train display signs. There are quite a few houses on either side at first, but we are soon out into the countryside. There's plenty of sheep on either side of the track and it is here that we pass over the border into Wales. I'm just thinking how I would like a cup of tea and that instance (I kid you not!) a guy arrives with the refreshment trolley and my wish is his command!!! By now we are on the left edge of a hill with a valley below us. We slow for Knucklas, a single platform station with red brick shelter, but don't stop. We then go over a viaduct with views of the village below us. We are now on the edge of a hill on the right side of us and the scenery is changing into hills on both sides, with cattle grazing. There's quite a drop to the valley below us on the left and we seem to be going downhill again. We've now been going an hour and I am a quarter of the way into my journey, though it doesn't seem that long. We suddenly enter a tunnel and you get a rush of air. We then slow for Llangynllo station, which has the same red brick shelter on a single platform. We don't stop which is hardly surprising as Llangynllo is just a hamlet of three houses! The train continues to go downhill, passing sheep grazing on the hillsides. We enter a cutting and the driver sounds his horn before we slow down for Llanbister Road, which is identical to the previous station. There is the old station building on the left and the remains of a second platform. We still continue downhill at about 50 mph on unwelded track with a hillside on our left. The landscape is flatter now, with plenty of sheep to be seen. You can tell that there were once two tracks here. Then we slow for Dolau station, where two people get off. It must rank as the loveliest station on the line so far, with colourful flowers everywhere and even a plaque to commemorate the visit of the Queen and Prince Philip in 2002. Mind you I couldn't see any houses nearby, just a few farms in the vicinity. We soon speed up to 60 mph again and see both sheep and cows on both sides. We go into another tunnel and then emerge at Pen-y-Bont station, which has a turquoise wooden shelter on the right and the remains of a second platform on the left. We continue to descend as the landscape flattens more, though you can see hills in the distance. We go under the A44 and A483 and slow again, as houses appear on both sides, indicating we are coming into Llandrindod Wells. The track becomes double here and we stop for a level crossing signal against us. We then pass a wood yard and a Tesco, before coming into the station, which is just called Llandindod. There is a signal box at the end of the platform and a passenger informs me that this is now a museum. There are original station buildings on both platforms and several passengers get on or off here. We go into a cutting, passing plenty of houses and then once we are clear of the town, we start to climb once more. It starts to get more hilly again with plenty of sheep grazing on both sides. We seem to be going at a steady 50 mph now, with the train wheels screeching now and then. Next up is Builth Road, which has a stainless steel shelter with a large red brick station building beyond that, split up into private dwellings. There are a few houses to be seen and soon after leaving Builth Road we cross over the River Wye and then pass through a short tunnel. The train seems to be going downhill again. After another short tunnel, we pass through Climeri station, which has a corrugated iron shelter. We then go into a low cutting, continuing to descend, before slowing for Garth, which is another small hamlet with about four houses. the station has a red brick shelter this time and the remains of a second platform on the left. It is becoming more hilly now and we pass through another tunnel, before slowing for Llangammarch station, where we stop to let a passenger on. It has the usual red brick shelter with wooden canopy and this time it is a village as opposed to a hamlet. We pass a caravan site on the left and then start to climb with views of higher hills ahead of us. We are on an embankment now and then go into a cutting before slowing once more for Llanwrtyd station, which has two platforms in use and is another well kept station, with lots of flowers on the left hand platform and the original station building on the right. This is the half-way point of my journey to Swansea today and this is where the two trains on the line cross over. In fact the drivers and guards do a swap! The new guard comes along the carriage and checks everyone's tickets again! I am asked where my destination is - again! We seem to be climbing once more and the hills are getting nearer. You can see the famous Sugar Loaf Mountain on the right and it isn't long before we reach Sugar Loaf station, which is the tiniest station on the line so far. Straight after it we go into another tunnel, which is by far the longest on the journey. It is now quite mountainous, with steep sided mountains to our right. We start descending again and the track turns to the right and the left. There's a pine forest on the left and ahead you can see more mountains. The refreshment trolley appears once more, but I 'm OK at the moment. We go over the Cynghordy Viaduct, with views of the Brecon Beacons on the left in the distance. We then come into Cynghordy, where two passengers are waiting to get on, watched by a couple of Network Rail workers, It has a blue coloured shelter plus a few tubs of flowers, but looks like it's in the middle of nowhere. The train then continues to descend, clinging to the edge of a mountain on the right. The land gets flatter again as we start to see houses appear on both sides. We have to stop for a level crossing before we come into Llandovery station, which has two platforms and is also in good order. On the left is the main station building, which is made up of the local grey stone, though there is also the usual red brick shelter. On the other side is a small shelter. A different guard gets on here for some reason, as it's not that far from Llawrtyd. We then continue along a flat valley with sheep grazing in the fields, passing over the river Towy. We then stop at Llanwrda, which has the usual red brick shelter on the single platform on our right. The train goes at a steady 50 mph for a short while before crossing the river Towy once more and then we slow for Llangadog, where we stop. It has a newish looking purple brick shelter on its single platform. There's some sort of factory on the right just beyond the station, then its countryside soon after. We continue along a flat plain with hills in the distance, crossing the river Towy twice more. We continue along the flood plain of the river Towy for several miles and then we come into Llandeilo station. It has two platforms, both with the turquoise coloured aluminium framed shelters. It is quite busy and soon after leaving the station, we cross over the river Towy for the last time, before it goes off west to Carmarthen. Soon after we stop at Ffairfach, which has a small turquoise coloured wooden shelter on its single platform. We then start to climb again as it gets more hilly and the train reaches 50 mph. It's also more wooded here and on the right I can see what looks like the remains of different tunnels cut into the rock face of a hill. We then slow and stop for Landybie, which has quite a large grey stone shelter on its single platform. We go at a steady 50 mph through a wooded area, then houses start to appear and we slow down and stop at Ammanford, which looks like it has been rebuilt in recent years, with a large purple coloured brick shelter. About ten people are waiting to get on, indicating that this stretch of line provides a valuable service for locals wishing to go to Llanelli or Swansea. We don't go very far before more houses appear and we stop at Pantyffynon station, passing an old semaphore signal as we enter the station. There is a large yellow stone station building which is in the middle of an island platform, though only the one platform is in use. On the left there are some sidings that are slightly overgrown and a branch line comes in from Gwaun-cae-Gurwen Coal Loading Terminal to the east. Just beyond the station we stop at the signal box to exchange tokens. We then speed up to about 60 mph. It is quite hilly on the left as we skirt along the outside edge of a hill, whilst on the right it is much more flatter. We move onto a low embankment then come to a halt at Pontarddulais, which has a very long single platform. It seems that it has recently been landscaped with large flower beds planted on the platform. There is also a large aluminium framed shelter. Next we go into a short tunnel and then speed up to 50 mph. A double track goes off to the left and then we go under the M4. Then the double track of the Swansea District line joins us from the left. The track is double from now on as we cross over onto the left hand track. It is now very flat with marshland on the left. 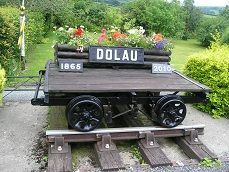 We then stop at Llangennech station, which has lots of nice flower beds, built into old sleepers on the platform. Both platforms have dark blue metal shelters. The estuary of the Gower is now on our left and we travel beside it for several miles, the track turning sharply to the left. It is quite picturesque. Then a small oil refinery comes into view in the distance, breaking the spell. We slow, but don't stop at Bynea station, which has two platforms with two grey metal shelters on them. We speed up again and go under the A484, before slowing down as we join up with the South Wales mainline on our left. We are now travelling in a westerly direction. We pass some old overgrown sidings on the left and there are even some rusting wagons in them. On the right opposite is Trostre Steel works, with some sidings in front of it. It is very flat here and in the distance ahead you can see some mountains. We pass more factories and there are signs that it was once four tracks wide here. Houses then appear on both sides and we come into the down platform of Llanelli station. There is a small station building on the left, but on the right is a very long station building. The driver changes ends and the train is only in the station a couple of minutes before it goes back the way it has come. The train then continues eastwards along the South Wales main line, going onto single track across the Gower estuary and through Gowerton station. It then reaches Swansea and passes Llandore depot, before turning south and goes on for a mile before reaching Swansea station, which now has just four platforms. It then goes on to Cardiff, making this journey one of the longest train journeys in Britain in time terms.